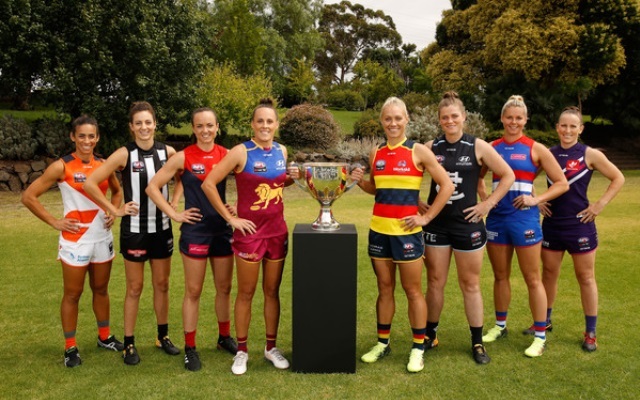 The second season of the AFLW is providing some down-to-the-wire drama, with five teams still in the chase for the two spots in the NAB Women’s Grand Final on March 24. The two sides at the top of the ladder, number one Western Bulldogs and number two Melbourne Demons play each other in Round 7, the final game of the home-and-away season. Western Bulldogs seemed to have one spot in the Grand Final locked away, but the Greater Western Sydney Giants inserted themselves into the mix and prevented the Bulldogs from clinching with a 7.4.46 to 4.4.28 win at UNSW Canberra Oval. Betting for the 2018 Grand Final winner sees Adelaide Crows Favourite at $4.50 - Bookmaker Bonus Bets will probably see you get even better odds. Melbourne defeated the Carlton Blues 8.9.57 to gain a tie with the Bulldogs in terms of won – loss record. Western Bulldogs has almost a 30-point advantage over the Demons in the percentage column. Following those two sides and still contending are the GWS Giants, the Adelaide Crows and the Brisbane Lions, all with three wins. The Giants and the Crows played to a draw in Round 3, something that may come back to haunt both sides. Brisbane suffered a Round 6 loss to the Collingwood Magpies over the weekend, by the unexpected score of 5.9.39 – 8.5.53. That loss following the Round 5 loss to Melbourne has the Lions on life support. Visit afl.com.au and CrownBet, the official wagering partner. Those five teams are all in contention, to varying degrees. Here are some of the scenarios that will decide the two sides that will play in the 2018 AFLW Grand Final. Three of the matches will in all probability decide who plays on and who goes home. Only the game between cellar-dwellers Fremantle and Carlton is meaningless. Starting from the top, the Bulldogs need only to beat Melbourne. If they lose, the Dogs will need both the Crows and the Giants to lose, with Brisbane winning by a small margin over the Giants. With so few games, percentages can swing dramatically. The Demons simply need to beat the Dogs. If they are unable to do so, they will be in very much the same situation as the Dogs, relying on the Crows and the Giants losing and Brisbane winning by a small margin. The Giants’ situation is straightforward. They must beat the Lions; the Crows must lose. That will enable the Giants to jump over the loser of the Bulldogs – Demons match. Adelaide needs to travel to Olympic Park Oval, along with the Giants losing to the Lions. If that scene plays out, the Crows can earn a spot in the Grand Final over the loser of the Dogs – Dees game. Brisbane needs all manner of assistance. They must beat the Giants on the Giants’ ground, the Crows to lose and the Bulldogs to beat the Demons by enough of a margin to swing the percentage in their favour. They could aid their cause by beating the Giants handily. If by some unlikely twist of fate the Demons – Bulldogs play to a draw, the Crows, and the Giants both win, all top four teams would finish on 18 points and the Grand Final sides would be determined by percentage. It is complicated and almost begs the league to add another round to the finals, something that could well be expected if the AFLW continues to maintain the momentum of its first two seasons into its third.